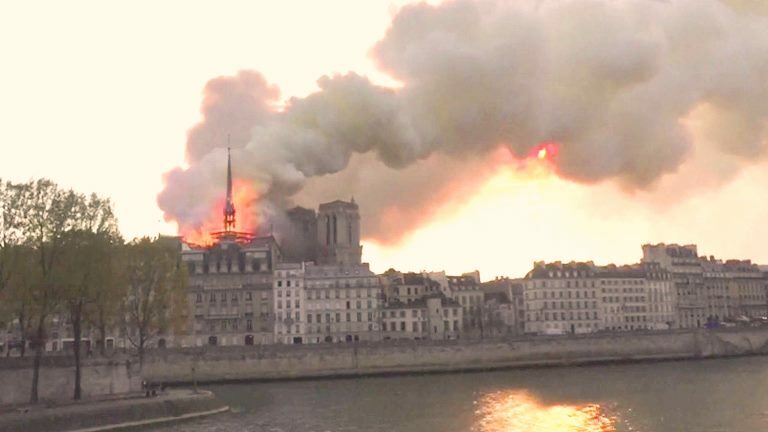 Residents in the French Capital Paris are helplessly watching as 856 years of history burn into ashes after fire broke out on Monday afternoon at Notre-Dame de Paris a medieval Catholic cathedral. Large thick plumes of smoke and fire could be seen exuding through the windows of the cathedral as firefighters used modern equipment to battle a massive blaze. This cathedral towering [69 m] 2400 feet high is considered to be one of the finest examples of French Gothic architecture. According to the mayor of Paris, Anne Hidalgo, it as a “terrible fire” and has urged people at the scene to respect the boundaries set up by fire crews in order to ensure that they remain safe. Visited by millions of people every year, the cathedral has been undergoing renovations after cracks began to appear in the stone, sparking fears the structure could become unstable.